Book Signing & Class with Cathy Jakicic! Join us August 27th from 2-5pm for the Twin Spin Bracelet or just stop in and have Cathy sign a personalized copy of her new book for you! Purchase the book at a special one day only rate of $19.99 and join us for the class for free! Twin Spin is a beautiful easy bracelet to whip up! 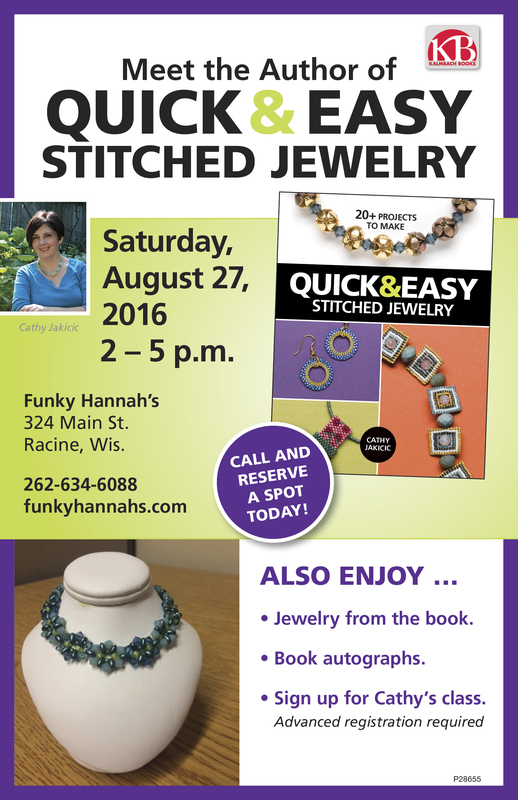 This great class is a variation of a project in Cathy’s new book Quick and Easy Stitched Jewelry! We’ll have fun door prizes and you’ll get a chance to see projects from the book! Call us to register for class or just stop in and meet Cathy! Details on the class can be found under the classes tab….